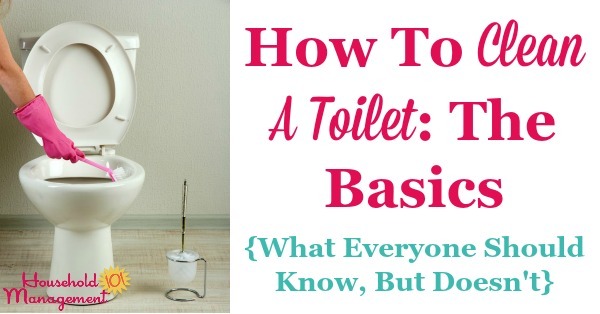 Learning how to clean a toilet is something everyone who uses a toilet should learn. Below I've provided instructions for exactly how to do it. This is back to basics kind of information, most of which everyone should know, but I've found some people (including kids until they're taught) don't. 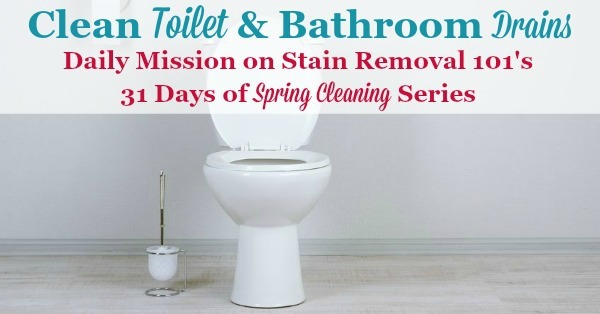 Fortunately, cleaning a toilet does not have to be a particular onerous task if it is done on a regular basis. How Often Should I Clean My Toilet? Ideally, you should clean each toilet in your home at least weekly, and more often if needed, as part of your weekly house cleaning schedule. One instance where you will need to clean more often is when your children are potty training. Another time is when you or one of your family members has been sick. The more people using the toilet on a frequent basis the more often it will need to be cleaned, so if you've got a large family then once a week might be way to infrequent for you, and every other day may be needed, for example. Fortunately, if you clean your toilet with enough frequency it never gets really nasty dirty and isn't as difficult to get clean as if it is neglected for a very long time. 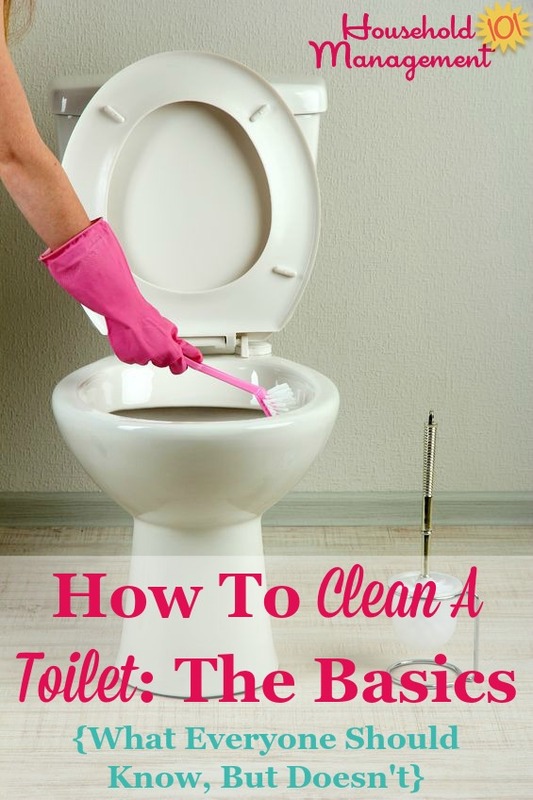 You can use several types of cleaners to clean the toilet bowl. Any one of the following will work, but please choose only one of these three and DO NOT combine any of these types of cleaners together as this can cause a toxic gas to form. If you use such a cleaner only use it to clean the toilet bowl, and not other portions of your toilet. Follow instructions for how long to let it sit. These cleaners often have harsh chemicals so be careful not to splash them to avoid contact with your skin or eyes. If you'd like to find a good cleaner to use, check out these toilet cleaner reviews. Add approximately 1/4 cup of bleach into the bowl and let sit for a few minutes before cleaning. Using bleach will disinfect your toilet bowl. If your toilet is prone to rust stains, this is not a good cleaner choice because bleach causes rust stains to set. Add approximately 1/4 cup of vinegar into the bowl and let sit for a few minutes before cleaning. Using vinegar works well if you've got hard water build up in your toilet, but it may not clean some of the toughest dirt and grime. You can find even more homemade toilet bowl cleaner recipes here. Once you have chosen a cleaner for the toilet bowl and are in the process of letting it sit for the appropriate amount of time you should go ahead and clean other areas of your bathroom or just wait. Some how-to guides (including the video below) say to go ahead and clean the toilet seat and the rest of the exterior of the toilet while you wait for the cleaner in the toilet bowl to do its job. You can do this if you need to, but be careful of accidentally mixing cleaning supplies if you do this, because if you do you can make a dangerous chemical gas. Ideally, you should go ahead and completely clean the bowl, flush, and get rid of all the bowl cleaner before cleaning the toilet exterior. The next step in how to clean a toilet is that once the toilet bowl cleaner has sat long enough in the toilet bowl you can use a toilet brush to scrub the bowl. Make sure you use the brush to get up under the rim of the toilet and also as far down into the trap as the brush can reach. Then, just flush the toilet and return the toilet brush to its holder. Helpful hint: It is really gross to have to carry a toilet brush around between multiple toilets in your home, because after they've been used they tend to drip while drying. Do yourself a favor and invest in a toilet brush for each bathroom, plus a holder to place it in between uses, so you don't have to move around this brush more than necessary, or get drips of yucky liquid throughout your home. Should You Use Automatic Toilet-Bowl Cleaners? There is debate about whether to use these automatic cleaners or not. If you clean your toilet regularly, as recommended, they probably are not necessary. In addition, if you have brass fittings inside your toilet make sure that the automatic cleaner does not corrode brass. The bottom line is that if you are going to use an automatic cleaner be cautious of what you use to make sure it does not cause unnecessary wear and tear to your toilet. Cleaning the toilet bowl is an important step in the process of cleaning your toilet, but don't forget the exterior as well, which can also get gross. This includes the seat and lid, as well as the pedestal. Spray all parts of the exterior of the toilet with a disinfectant cleaner and wipe with a damp cloth that you use specifically for this (and only this) purpose. You don't want to cross-contaminate other items in your bathroom by using the same cloth you used to clean the toilet to then clean other things, like your sink, for example. Yuck! As an alternative, use disinfecting wipes to wipe down all these surfaces of the toilet and then just throw away the wipe. This method is not as environmentally friendly, but you don't have to then deal with washing the cleaning rag. Whether you use a cleaning cloth or disposable wipes you should wipe all surfaces of the toilet because it is amazing what parts of the toilet can get dirty. Obviously, wipe the toilet lid surface and underneath, the seat and underneath, but also do not forget the pedestal where the toilet is bolted to the floor. The pedestal of the toilet is an especially important area to clean regularly when you are currently potty training boys! In addition, do not forget the toilet handle because it gets touched quite frequently by dirty germy hands. Finally, special care needs to be taken if you have either a plastic toilet seat or wood toilet seat. Do not use abrasive cleaners on a plastic toilet seat because it will damage the finish. Wood toilet seats should be washed with mild dishwashing liquid and water so that the clear coating is not taken off the wood. If a toilet has become very dirty because it has been a very long time since it was cleaned you have several possibilities, depending on what about the toilet is dirty. For all of them you should first clean with the method described above. Pour a cup of chlorine bleach into the toilet, close the lid and let it sit overnight, and perhaps several days. This can do wonders for built-up stains. 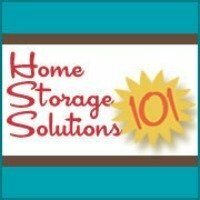 If instead of stains, however, you have hard water rings you can let vinegar sit in the toilet for a while to eat away at the lime and other mineral deposits. Another possibility, as suggested in the video below, is to use a pumice stone or stick to clean the ring at the water line. You can wet the stone in the water and rub it on the ring. A word of warning: Vigorous use of the pumice can scratch the finish on certain types of toilets, so always use sparingly. Plus, a pumice stone should only be used on white, vitreous china toilets, not on colored, enameled or plastic fixtures. If rust stains are the problem use a rust removing product from the cleaning section of your local store. Always follow label instructions for use. I suggest Super Iron Out (click the link to read some reviews). Still want to know more about how to clean a toilet? Check out this how-to video below (it is just a little over two minutes long).